On Tuesday, February 27th at around 12:30 a.m., there was a water main break in the city of Eau Claire. This break was unique in that it flowed into the sewer system, causing the sewer to backup and flood many homes in the neighborhood. The break occurred in the street right outside our friend and colleague's home, Rose Thomas. Rose had over 8 inches of water tainted with sewage and over 25 pounds of sand flood her basement. Although much of it was diluted with water, because there was sewage in the flood water, Rose essentially lost everything in her newly finished basement. All the flooring needs to come up and her dry wall needs to be redone. She lost her new washer and dryer and needed to purchase a new furnace immediately. Her washer and dryer need to be replaced in addition to the rest of her belongings. Unfortunately, this type of incident requires a very specific type of insurance which Rose did not carry (most of us likely do not). 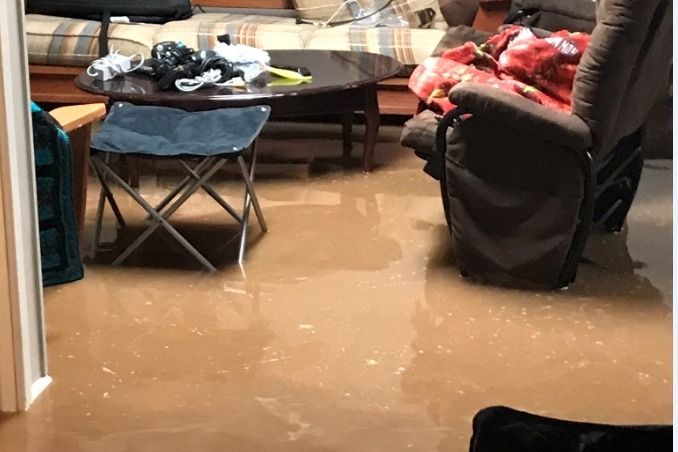 In addition, the city's insurance denied the claim and is only covering cleanup costs and only up to $1,000.00 for lost belongings to each home with damage, and nothing for restoration. The repairs in Rose’s home is estimated to be $20,000.00! Rose is also expecting her first child in August. This is an exciting life event and something she has always wanted. The responsibility and financial aspects of having a baby can be overwhelming enough on its own, but now she's having to deal with making her living space clean and useable again on top of preparing for the bundle of joy. I’ve known Rose for 10 years and she is one of the most generous people I know! If someone needs help with a project at work, she is always the first one to volunteer. She has helped our team on several occasions including covering classroom training so we could have much needed time off or time to work on other projects. For several years, she has cooked Thanksgiving dinner for friends who live far away from their families (as she does) and did not have a place to go. Rose is also well known for baking cookies to welcome new employees, making sure everyone is well fed and taken care of in general, and for creating beautiful baby quilts for all her friends and colleagues when they are expecting. While we are on the subject of quilting, Rose lost all her quilting supplies including some that were family heirlooms. Rose takes care of and helps everyone, and now she needs our help! Any amount (no amount is too small) you can give will help ease the financial burden of replacing Rose's furnace, washer/dryer, furniture, quilting supplies, flooring, shelving, and other necessities to get her home back to where it was, and to make it ready for her baby’s arrival.